On March 8, 2018, my wife and I decided to offer ourselves a moment of escape and relaxation by going to a comedy show starring two talented Haitian actresses living abroad but passing through in Haiti. We both needed that to relieve moments of stress and anxiety. We had decided that this night was going to be our night. Our moment. And work was our last concern. We did not even think about it. The moment had to be pleasant with laughing and joking. The show was about to start when my phone start ringing. I did not have the phone number calling me in my contact list. I hesitated before answering because the call had disturbed my moment of relaxation. I thought I should have turned off my phone. But, the conversation I was going to have is a proof that sometimes you have to deny yourself and continue your ongoing commitment. The call was from one of my psychology students at a private university in Haiti. This student knows that I am the Clinical Director of Nadege in Haiti. She remembered I was explaining to my students during our first class that Nadege is an organization working on restoring hope to survivors of sexual violence in Haiti by providing holistic care to victims in our safe house. She asked me if the safe house is already open because she needed help for a young woman who had just been raped. I told her unfortunately, our safe house is not open yet. However, I think there is a solution. I suggested she goes with the woman who was victimized, as quickly as possible, to Doctors Without Borders, which provides short-term 24/7 emergency medical and psychological care to victims of sexual and gender-based violence. All the more that Doctors Without Borders is a referral partner for Nadege. They will refer survivors of sexual violence to us for long-term care. I explained to her if necessary, the survivor will always be able to join Nadege's program for long-term support with a long stay in the safe house. My student said she understood everything and noted the information. We promised to keep in touch so that I will be updated on the development of the situation. After this phone conversation, I was able to attend the show. And it was a great moment after all. Five days later, I had a meeting call with Emily, the founder of Nadege, and our colleague Amy, Nadege’s Administrative Director. While we were discussing about a chapter of the Bible in Matthew 16, I told them about my experience of March 8. The story touched them so much. It was an emotional moment. I am committed to restore hope to survivors of sexual violence in Haiti, to work with my clinical staff at Nadege to provide holistic care to them. It's my mission. It's my commitment. Somehow, it's my cross. I have to be ready to take up it and continue my ongoing commitment. So, if necessary I have to forget myself to carry out this work. And you, are you ready to do the same? In the midst of protesting in Haiti, we’ve had to postpone trips to Haiti until we can ensure the safety of our teams. We’ve received reports from our staff team that the situation has been more peaceful in recent days. If the calm continues, we will begin to reschedule our construction trips in order to complete the interior of the safe house and welcome survivors in Haiti. As Haiti experiences civil unrest due to political and economic instability, please join us in praying for restored hope, peaceful resolutions and continued protection over Nadege’s staff and the beautiful people of Haiti. We are so thankful for a brand new partnership with ISNAC, a professional school in Port au Prince. They have agreed to offer full and partial scholarships to graduates of Nadege. We believe holistic healing requires partnerships, and we love how God continues to connect us to like-minded organizations! As the opening of the Safe House rapidly approaches, we are in the process of hiring clinical staff, forging new partnerships and preparing the house for the arrival of those sweet women. We have multiple trips scheduled to Haiti in the upcoming months. Our next team is a group from one of our partner churches, South Creek. They will be working to finish the interior of the house. We cannot wait to open our doors in May! Please join us in prayer for safe travels and provision for the South Creek Church team. Also, keep our founder in your prayers as she is traveling, interviewing and soaking up all things Haiti! We are so thankful for the recent men’s team (pictured above) that traveled to Nadege to complete the dry wall in the Safe House! Great job, gentlemen! Nadege’s 4th Annual “Breakfast with Santa” is TOMORROW! We’re only one sleep away before we welcome the community to join us to restore Ho Ho Hope to women and their children in Haiti. Join us Saturday, December 8th at Oakbrook Church to grab a picture with Santa & Mrs. Clause, visit live reindeer, get your face painted, and peruse the raffle items and Nadege Store. Tickets are available here. Please join us in prayer for the “Breakfast with Santa” committee and volunteers. Those elves have been busy this week preparing for your arrival. While you’re praying, please keep our upcoming teams in prayer as they gear up for trips to visit the safe house in Haiti. They will be finishing the interior of the building before we open this Spring! We are incredibly thankful for God’s safety and provision for our most recent team trip to Haiti. Protests and crazy weather raged throughout parts of Haiti, making travel difficult, but God’s hand was in it all and everyone made it home safe and sound. When we set out to hire a Clinical Director in Haiti, our description of the ideal candidate was extensively long. Many advised us to lower our standards— to hope for the best but to set more realistic expectations. We tend to struggle in setting realistic expectations, mostly because we believe strongly in a God who promises to do the impossible. As always, He delivered and more than exceeded our expectations. Meet Dr. Jeff Matherson Cadichon. He was born and raised in Port-de-Paix, Haiti and received his Doctorate in Clinical Psychology at the University of Burgundy in France. A few months prior to posting this position, we sat down with the President of the Haitian Psychological Association to connect and inform her about the vision of Nadege as well as to discuss our ongoing staffing needs. She highly recommended Jeff for the Clinical Director position due to working with him on a research project to determine the post-traumatic effects of the 2010 earthquake on Haitian women and adolescent girls. Let me pause for a moment and say that we fully expected to hire a woman to fill this position. Our highest priority as an organization is to protect the women we will serve. We understand the possibility of re-triggering individuals who have experienced traumatic events at the hands of men, and how the very presence of a man can result in flashbacks and other post-traumatic symptoms. However, the reality is these symptoms will occur at some point in the healing process, whether it’s during the treatment process or once they begin a new life outside of the house. We would rather those symptoms occur while women live in the house so their care team can work to address them together and teach them healthy coping strategies to practice in a clinical setting. That being said, Jeff’s role will involve overseeing the clinical staff— all of which will be female. The clinical staff will have one-on-one interactions with the women and their children. If Jeff needs to meet with a woman, her assigned counselor will be in the room in order to provide the highest quality of care possible. We also love the idea of a strong male presence at Nadege because we strongly believe that the work done at our safe house only treats a symptom of a bigger problem in Haiti. In order for lasting change to occur, we must be a part of infiltrating a culture, which will involve educating men on how to treat women. The best candidate to address this deep seeded issue is other men. We are convinced that the eradication of sexual violence in our world must include the advocacy efforts of both women AND men. We are excited to welcome Jeff to the team. He loves God and people well and has a passion for restoring HOPE to women in his home country. His list of credentials is impressive, but it was his passion, collaborative spirit and desire to see real change take place in Haiti that made hiring him an easy decision, while also serving as a reminder that nothing is impossible with God! As you are reading this, Emily Hays and Beth Waterman are in Haiti meeting with the new Clinical Director of Nadege! They will be training, brainstorming and sharing vision for the beautiful women that will be living at the safe house. Stay tuned for the “big reveal” introduction to the new director. As the Safe House is nearing completion, we are preparing to send teams to Haiti to complete construction. Please pray for wisdom and guidance as we assemble teams, and for safety and provision while traveling. Also, please keep Emily and Beth in your prayers as they are traveling this week. Have you heard the great news? The 3rd Annual Restored Gala raised above and beyond our goal this year!! Thanks to the generosity of so many, we were able to raise $102,000 to run operations of the Safe House next year! Thank you for all of the love, support and prayers covering this event! In reflection of our Restored Gala, we revel in the fact that God has been in this journey from the beginning. He is worthy of our praise. Will you join us in prayer for our restorers as they continue to transform their items as well as fundraise for the Gala? We are so excited to see how God will use these once broken items to restore hope to the beautiful women of Haiti. We are so thankful to welcome Amy Roe to the Nadege team this month. She will be joining us on a part-time basis to help with all the things. Amy was one of a handful of people who literally prayed Nadege into existence, and now her timing could not be more perfect as her MANY strengths are directly in line with our current needs as an organization. Welcome to the team, Amy! 1. WHAT IS YOUR FULL NAME + NICKNAMES? Sophie: Sophie Nicole Frazier, but I go by Sophie. Adrianne: Adrianne Savannah Gamester. Sav, Savvy, or my favorite: Savadrianne. 2. WHAT COLLEGE DO YOU ATTEND? Adrianne: University of Evansville for 2 years, IUK for 2 years. 4. WHAT IS YOUR HIDDEN TALENT? Adrianne: Cooking like I'm on "Chopped"
5. WHAT IS YOUR FAVORITE SUMMERTIME MEMORY? 6. WHAT IS THE CRAZIEST ITEM ON YOUR BUCKET LIST? 7. WHAT IS THE BEST KNOCK-KNOCK JOKE YOU KNOW? Sophie: "I know a great Knock Knock joke!" "Ok, tell me." " All right. You start." "Ok, Knock knock!" "Who's there?" Adrianne: "Knock, knock?" "Who's there?" "A little old lady." "A little old lady who?" "All this time, I had no idea you could yodel." 8. WHAT DANCE MOVE CAN YOU TOTALLY ROCK? 9. WHAT RAD EXPRESSION DID YOU OVERUSE IN HIGH SCHOOL? 10. OUT OF ALL THE INTERNSHIPS YOU COULD HAVE CHOSEN, WHY DID YOU CHOOSE NADEGE? Sophie: I have always had a passion for Haiti and human trafficking, so Nadege was a perfect fit for me. Adrianne: The passion, drive, and mission of it all. We are in the process of hiring our first full-time employee in Haiti. The opening is for a Clinical Director who will oversee the mental health department of our aftercare facility. In order to fund the staff team in Haiti as well as the women and children who will soon occupy the house, we are looking for Hope Multipliers to become monthly sponsors at $40 a month (which equates to about two drinks at Starbucks or one meal at McDonald's per week)- not a lot when you consider the restorative impact of those dollars! Will you join us in asking God for wisdom, discernment and the right connections as we hire a Clinical Director? This position will be vital in ensuring quality care to the future women and children of Nadege. There is so much to be thankful for in this season of building. Just over two and half years ago, Nadege was only an idea. Today, steel beams are joining to form a location where hope will be restored for years to come. This was all made possible by a God who does the impossible and generous donors and volunteers who have stepped up to be a part of the solution. 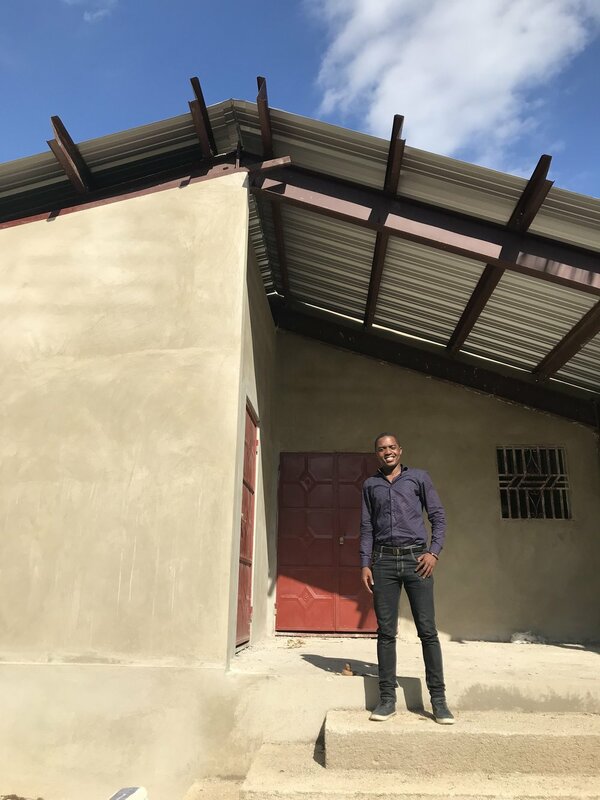 Our team recently returned from an amazing trip to Haiti full of pursuing partnerships, connecting to other NGOs and witnessing the beginning phases of construction (see picture below) happen on our land. Another team will leave for Haiti next week to continue overseeing construction. This is a busy season for Nadege, and we're loving every minute. Our curriculum team is ramping up to develop a culturally-sensitive mental health program. Will you pray for wisdom and progress as well as continued connections to counselors and social workers in Haiti? To see a dream becoming a reality has us feeling all the feels. We are thankful for every block, the construction team (Haitian & American), and every dollar donated that is now transforming this land into a place of hope and restoration. What a beautiful story God is writing through Nadege! We are excited to announce that as of yesterday BOTH containers (full of building materials) reached our land. Although this process has been longer than expected, the timing is actually perfect because we have a team traveling to Haiti next week to meet with our Haitian engineer to oversee the start-up of construction. We will then leave the exterior build-out in the hands of a very talented Haitian team! We are embarking on a new season of building, strategizing and planning and could use a few extra prayers for wisdom, discernment, provision and divine appointments. We are incredibly thankful for all of the hard work of our Board Chairman in Haiti, Guy (pictured above), for the tireless work he has put into getting those shipping contaners out of port. Within the last month, he has made multiple 6-hour (round trip) drives to our land, saved us $4,000 in custom fees and managed the logistics of getting the containers to our land. Employee of the month, for sure! After some delays in Miami, the building will be shipped this weekend and arrive in Port au Prince, Haiti on January 23rd. This means the materials that make up the safe house will likely reach our land a few days later. A few Nadege board members will take a trip to Haiti shortly thereafter to get the ball rolling on construction. We've never been more excited about a container full of steel! Please continue to pray for the construction process to go smoothly + safe travels and divine appointments for our construction teams. As we prepare year-end giving statements (they will reach your mailboxes soon! ), we are so thankful for the outpouring of generosity in 2017. Nadege is on the brink of building a safe house where hope and healing will take place for survivors of sexual violence in Haiti because of YOUR faithful support. Thank you for making this dream a reality! "Now is the time to make justice a reality for God's children" --Martin Luther King Jr.
A few months ago, we announced that we had purchased the building package for the safe house. We are happy to report it should arrive in Haiti by early January! This means construction can begin shortly thereafter, bringing us one step closer to seeing hope restored for women in Haiti. Please join us in praying the construction process goes smoothly. Groups will be traveling to and from Haiti throughout 2018 to oversee and assist in the building process. Will you also pray for safe travels and for God to break their hearts for what breaks His? After our most successful Breakfast with Santa to date (Thank You! ), Guy, our board chair in Haiti, was able to share about a recent experience at Nadege's land with Oakbrook Church. We are incredibly thankful to every single person who made Breakfast with Santa a success. The event grossed over $21,000 due to the generosity of so many of YOU. From our amazing sponsors to every attendee to the hard work from our committee and volunteers, we are oozing with gratitude for the opportunity to not only put dollars toward safe house operations, but to also bring joy and hope to our local community. Say hello to Lindsay Bollhoefer! She is the mother of three little boys. Her husband is in the army, and she teaches music at Northwestern Elementary. In her spare time, she enjoys adventuring with her boys, and singing and playing piano in the worship team at Oakbrook. Read more below about her love for Nadege's mission, and her excitement leading up to the Restored Gala. 1. In three words describe yourself. So hard! I asked my husband to answer this and he sent me a list of ten words, so i chose from that. He said that I'm adventurous, intelligent and abnormal. 2. What does hope mean to you? The time that I've spent working on my Restored piece has become a time of meditation on hope and all that Nadege is going to do. I think about how I can spread the word about Nadege and its message of hope. For me, hope is faith in a brighter future. It's a reason to wake each morning and greet the day with optimism. 3. What has caused you to help restore hope in Haiti? I am so blessed to be able to follow my dreams in this life. I can have a career that I love, provide for my family, and pursue the things I am passionate about, all because I live in a place where I am valued. I want every woman to feel valued and have a chance at living the life that she deserves. That is what drives me to help Nadege's mission. 4. Our theme for the Gala is Isaiah 61:3. How have you witnessed "beauty coming from ashes" in your own life or the lives of others? It was difficult for us to conceive our first son, and I was emotionally in a low place. For a year we watched others have children or become pregnant, and it was very hard to be excited for them or enjoy babies. Finally, after much prayer, we met our son, Holden. If there is anything more beautiful than the birth of a child, I don't know what it would be. The gift of a new life is truly a miracle, and a gift from God. Well I don't know that I have any "hidden" talents. Music is my talent; I sing and play the clarinet and piano. Say hello to Nancy Bayer and Kendra Bayer-Foreman- a mother-daughter artist team! Nancy is a retired public school art teacher. Kendra gives art lessons and holds art workshops for students in both Tipton and Kokomo. She is also the creative force behind Handbags for Healing. The creative duo is currently working on giving new life to a set of 4 discarded chairs. Read more below about Nancy and Kendra's powerful words on hope and their belief that "helping women find their beauty again, giving hope to the hopeless, and a future walking with the Lord" is the heart of Nadege. Believing something better is possible and coming! We are both very optimistic people. Nancy: Our family has been involved with different mission organizations in Haiti for many years. we knew about the poverty, the voodoo practices, the lack of educational opportunities and the need for a life-changing meeting with Jesus. We recently have worked with Curtis Stout on a Bible-based art curriculum for Project 117. When we heard from Emily about the hopeless condition of many women in Haiti we wanted to use our art talents to help be restorers of hope to these women. Kendra: I desire to be apart of making life better for these women. 4. Our theme for the Gala is Isaiah 61:3. How have you witnessed “beauty coming from ashes” in your own life or the lives of others? Nancy: I personally have known many women whose life journeys have led them through really hard situations- abuse, disease, marital issues, mental illness, death, addiction, etc. I've seen over and over again how knowing Christ and experiencing the power of God's love has enabled them to go through the worst and come out on the other side bruised but not broken- beauty from ashes. Kendra: The older I get the more evidence I see of God's bigger picture...answered prayers, ripple effects, assurance that all things work together for good to those who are called according to His purpose. Nancy: I can still speak a little high school Spanish. Kendra: I can sing two notes at the same time...it is not pretty. Say hello to Julie Baldini. This is her second year restoring an item for the Restored Gala. She is a mom to three, passionate about serving the next generation and an advocate for HOPE everywhere she goes. We can't wait to see how she takes this small rocking chair and restores it into an item children will be using for years to come. Support Julie's campaign here and learn more about her in this week's #SpotlightSunday. Hope is a feeling down deep in your soul that gives you the confidence to courageously face each day! My heart aches for anyone living in hopeless situations. I have become educated about the number of victims of gender based violence in Haiti through the founders of Nadege, and I want to play my part in restoring hope to those victims. During my last trip to Haiti, I met 3 girls at a children's home who were displaced from their home after their mother committed suicide. These girls have experienced the most unimaginable circumstances, but they are finding joy each new day in their new home. Because of their new circumstances, these girls have a safe home and food to eat every day. They will receive an education, and most importantly they will hear about a God who loves them and will never leave them. I have what they call a green thumb when it comes to growing plants and flowers. A sneak peek to the piece Julie is restoring for the Restored Gala. Meet Doug and Dea Mygrant. They are crafty, hospitable and promotors of hope. This year they are lending their talents to nadege by restoring this old piece of barn wood into a beautiful farm house table. Don't miss your chance to bid on the finished product at the Restored Gala on 9/23. Until then, scroll down to learn more about this amazing couple and support their campaign here. The three words to describe Doug are creative, jokester and taskmaster. The 3 words to describe Dea are encouraging, outgoing, and animal lover (especially dogs). Hope to us means bringing joy into the world by being kind to people and letting them know you care. It is a small way to help for those who so desperately need our help, and we love to restore old pieces or make pieces into something new and fun. We witness beauty coming from the ashes every day in our lives because we mess up every day and we can ask for Gods grace in our lives and share it with others. What a beautiful truth that is! Doug's hidden talent is that he has installed two in-ground pools in our homes all by himself and loves doing multiple projects around the house. Dea's hidden talent is that she loves painting furniture and making it look completely different without going out and buying new pieces.